With the 2018 Randox Health Grand National just a month away, Selkirk trainer Stuart Coltherd has received a timely boost . His Aintree hopeful, Captain Redbeard, stormed home to win the Caledonian Best Handicap at Ayr Races on Saturday. Ridden by Stuart’s 19-year-old son Sam, the nine-year-old gelding led from start to finish. He held off a strong challenge in the home straight by Elusive Theatre to win by three quarters of a length and collect the first prize of £10,657 , and the Craigie Cup, at odds of 11/2. The victory was Captain Redbeard’s second of the season, following on from his triumph in the Tommy Whittle Chase at Haydock Park. It was jockey Sam Coltherd’s 32nd career win. “I was pleased by how well he ran,” said owner and trainer Stuart Coltherd after the race. Stuart added the race had been a perfect warm-up posibly for the Grand National, as the Captain’s traininghad been interrupted by the snow. 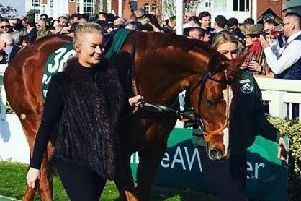 “We won’t officially know if he’s got a place in the Grand National field until after Cheltenham, but we’re hopeful he’ll be there on the Aintree starting line come April 14,” said Stuart. Captain Redbeard is listed at number 59 in the Grand National ballot, with Kelso trainer Sandy Thomson’s horse, Seeyouatmidnight, included at number 36.